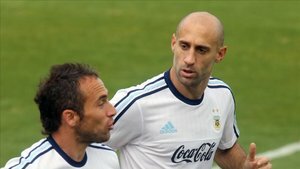 Pablo Zabaleta is weighing up bringing an end to his football career with his family. The former Argentina international, after 15 years as a professional, is likely to bring the curtain down at the end of the season with West Ham United in the Premier League. Zabaleta is likely to return to Barcelona. Since 2013 he has been married to Christel Castano, the Catalan journalist and model. The two have a home in the area. The right-back, who's also played in midfield, began his career with San Lorenzo de Almagro before moving to Espanyol. He spent three seasons with the Barcelona-based club, reaching the UEFA Cup final, before turning down Juventus in favour of Manchester City. During nine years with the English club, Zabaleta became a fans' favourite and won two Premier League titles, an FA Cup and a League Cup. However, after the arrival of Pep Guardiola and the signings of Kyle Walker and Danilo, he left for West Ham. At 33 (34 in January) he feels the moment has come to call time on his career. Even though he remains a regular at West Ham in Manuel Pellegrini's 4-2-3-1 system, he believes the right moment to leave the game is when his contract ends in the summer.